Well-loved in France for their functionality and style, Jeanne Beatrice market baskets are hand woven in the Atlas Mountains of Morocco out of renewable resources, including water reeds and palm leaves. They are naturally beautiful, environmentally-friendly, strong and durable alternatives to paper and plastic grocery bags. Very green, very chic, very typical of Provence – take your basket to the market and turn down the paper and plastic bags in style! 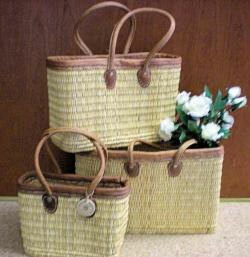 Also great for the beach (baskets LOVE water), the boat, knitting gear, a picnic, or for a weekend out of town. Best of all, a portion of the proceeds goes to benefit villages in Morocco where the baskets are made. Each market basket is hand woven out of water reeds and trimmed with soft leather, including 3/4 inch thick leather handles. Click the Banner below to see the complete selection and Order!